Arnotte Payne will perform his debut one man show 49 Shades of Black on November 4 and 5 at the Durban Jewish Club. 49 Shades of Black is a one man show about a Durban man who grew up with a slightly confused identity. A coloured man with black parents who was raised by his Indian granny in Stanger. Confused? Now you know why Arnotte Payne is hilarious - he has a little bit of everyone in him. The show explores interracial relationships, mixed families, politics and one-liner comedy. Payne is also a musical comedy genius and audiences can expect to see him twist famous tunes into hilarious parodies. Payne is a motivator, comedian, actor, singer, instrumentalist and public speaker. He has performed all over South Africa during the last 15 years and this year became the first Durban based comic to perform at the Comics Choice Awards. 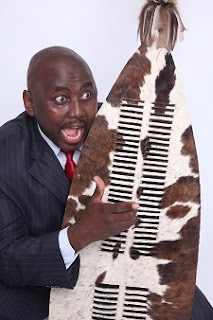 He has performed with the likes of Carvin H Goldstone, Eugene Khoza, Nick Rabinowitz, Laughing Stock, Trevor Noah, and Afzal Khan in venues such as Suncoast Casino, Sibaya, The Playhouse, 99% Zulu comedy and Durban Losing it. He was also voted best KZN comedian in 2008. He has featured on Christian radio stations as well as SABC with some of his renditions. He also featured in the hit buddie cop film Curry & Vice which screened at cinemas countrywide. His clean versatile comedy style has been well-received in a variety of settings ranging from weddings, parties, lunches as well as corporate functions. 49 Shades of Black has performances on November 4 and 5 at 20h00 at the Durban Jewish Club, 44 K E Masinga Road, Durban. Tickets R100 through quicket.co.za or call/ WhatsApp ‪083 291 5702 or at the door.